FTSE for FRIDAY #Nasdaq #Brent The UK market continues to power itself upward, lifted by what? We bang on about how important “Higher Highs” can be, a notion amply proved by market moves since March 17th. Once a market starts growing, it becomes difficult to slow things down, despite an entire political class’ best efforts. The immediate situation for the FTSE is slightly confusing. Generally when a “Higher High” cycle commences, the market will only grow so far before some doubt establishes, provoking a reversal to the point it all started. In the case of the FTSE, this means we should not be aghast to witness travel to around 7250 in the days ahead. Prior to this, we’d hope anything near term above 7371 should bring some oomph for an initial 7386 points. If bettered, secondary is at 7402 points and an ideal level from which relaxation can be expected. This sort of ambition comes nowhere close to bothering the BLUE downtrend, thus giving the impression hope remains for the longer term. Unfortunately, if taking our rhetoric as gospel, the index could continue to 7454 should 7402 be exceeded, so that’s a reasonable level to try a stop loss at. Our suspicion, should Brexit be delayed, is of reversal to 7250 prior to an attempt at BLUE on the chart. All of this is, of course, completely insane! We’re the first to admit it as there’s something going on which software alone cannot account for. When a market makes a Higher High, it’s almost unheard of for a price to accelerate to target without deflection. Instead, a price will generally make it around half way to a primary target and then, doubt establishes itself amongst traders. A sell off to collect profit thus will generally fuel a reversal down to whatever prior level it started from. Now, smart traders (in the absence of negative news) will again buy into a market, hoping for a bounce with the next surge upward hopefully exceeded the previous half way mark. Simple? Or just human nature? The FTSE complicates things as we’re showing a strange tier of target levels, a collection of 100 point leaps from 7402 through 7500 all the way to 7600. At present, the important detail comes if 7402 exceeded as continued traffic to 7509 is theoretically possible. We do expect that BLUE line to have a say in matters though. At present, we’re not inclined to take any reversal as serious unless the FTSE stumbles below the 7300 level before attempting our immediate 7386 target. This risks being a poor show, possibly the harbinger of coming weakness to 7196 and below to a bottom of 7164 points. 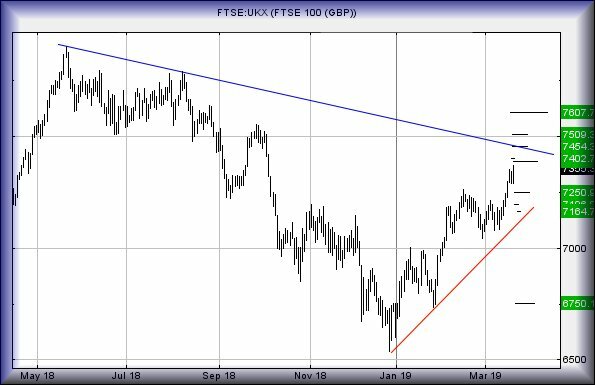 FTSE for FRIDAY (FTSE:UKX) The UK market continues to power itself upward, lifted by what? We bang on about how important “Higher Highs” can be, a notion amply proved by market moves since March 17th. Once a market starts growing, it becomes difficult to slow things down, despite an entire political class’ best efforts.